Are you tired of plain and borning plates when you have an event or a family dinner during the Holidays? Well, look no further because Create Ur Plate has you covered! How? Create a Plate-able (a sticker more less) that sticks on the bottom of the plate to make it personalized, you can then choose glass or disposable plates and you can choose salad or dinner plates. Check out how the process works. It is quite simple. 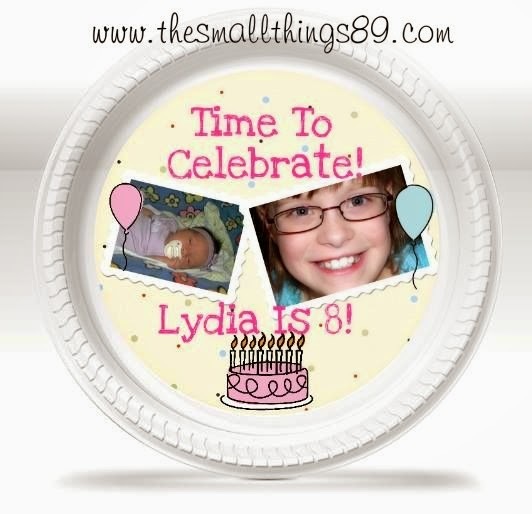 If you don't want to choose a pre-made design, you can create your own like I did for Lydia's Birthday last month! Check it out below! I chose to use a picture from when she was a week old and a recent picture for her 8th Birthday. How adorable is this? Check out the actual product below! I was SUPER stoked when it arrived, and yes it arrived FAST! You do have to stick the Plate-Able on the bottom of each plate on your own. It is a long process but totally worth it. Even her cousins enjoyed eating off of the plates! Did you know that the Plate-Able decals are reusable? They come in a package that you can store them in for the following year. So if you get plates that say "Brown Christmas Party" you can reuse them next year! How cool is that? The disposable plates that we received come in packs of 40. They are $9.99 for 40 of them. I liked the fact that they didn't look like your ordinary disposable plates. They were classy and cute. Each Plate-Able decal is $1.99. That is going to put you at around $80 or so, give or take. Not bad if you ask me! PLEASE remember the decals go on the underside of Create UR Plate plates. They are not meant to be put in the microwave or on top of the plates. There are so many endless possibilities when it comes to designing your masterpiece! Give it a try and let me know what you bought! Your guests will "Ooo! and AHH" over it, I know that mine did! These custom plates are too cool for words! Visit Create Ur Plate on their social media to stay up to date with the latest!